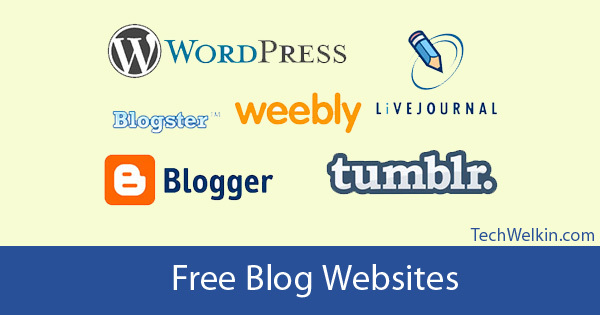 Looking for a free blog site that provides a great blogging platform at zero cost? Here is a list of best free blog websites. Begin your blog journey now! Asking this question and getting the right answer is very critical for your mission’s success. You must select the right platform before jumping onto the blog bandwagon. Quite a bit depends on whether you want to do professional blogging or whether you want to write as a hobby. To help you a bit in your effort, here I am giving a few suggestions on the web services where you can start your blog free of cost! Here are the best and free blog sites on Internet! This is my favorite. WordPress would be on top in my list of best and free blog sites. WordPress is a great software platform that can be used to setup a blog on any server. Through WordPress.com, the makers of this platform also provide you with free server space as well, thereby making the blog totally free for you. You just need to register and then you’re all set to begin your blog journey. Custom domain name: You can buy a domain name and point it to your WordPress.com blog. They also allow you to show their own ads on your blog, and you get a share from the revenue. You are not allowed to show Google AdSense ads or write paid reviews. You can not upload and use a theme. You’ll have to choose from those that are made available by WordPress. Modifications in available themes is not allowed. WordPress can suspend your account if you break terms and conditions. Well, seems like a long list of drawbacks! Although these limitations of WordPress.com are seriously hindering. Nevertheless, this is a great blogging platform. Most of the bloggers who want to make money from their blogs, they use self-hosted WordPress platform. Just go to blogger.com, log in with your Google account and start a fresh blog. You can show Google AdSense ads and also it is much easier to get an AdSense account approved if you begin to use a Blogger blog. You can select a template (aka theme) from a host of available ones. The best part is that Blogger.com allows to edit CSS and HTML. Consequently, you can really give your blog a unique touch of your own. You can write and make posts on the go. Blogger makes iOS and Android apps available for this purpose. Each page of your blog has to be smaller than 1MB. You can write as much as you can but the material should not cross 1MB limit. You get 15GB of total space for storing photos/images. This space will also be shared by Gmail, Google Drive documents and your other Google stuff. If you want to start a multi-author blog, you’ll have to keep the team size less than 100 members. Established in 2007, Tumblr also hosts millions of blogs. You can choose from easy to select and modify themes. On the go blogging is also available through mobile app, multi-author blogging and use of custom domain are also available. You can import any RSS feed into your Tumblr roll. Tumblr allows you to share your content on your Facebook, Twitter and WordPress accounts as well. So, it is easy for bloggers to let potential readers know what they have written. It’s admin panel backend could be a bit confusing to new users. It makes use of a lot of graphics. The text-editor, area where you compose a post, is not fully WYSIWYG. Tumblr is a better option for photo blogging or making blogs where images are predominant content. This good free blog site got buried under the weight of Blogger.com. But still it is a good place where you can start your blog. The best thing about this service is its name. It’s somehow nice to have a yourname.blog.com kind of cool address. The site provides all the regular features of a good enough blogging platform. Simplicity is the USP of this free blog service. Svbtle is famous for its super-sleek blog themes and those who like minimalist themes, this is a a great service. Blogs look very beautiful with mostly white background and plain black text. Earlier this service was invite-only —but now anyone can sign-up and start a Svbtle blog. Postagon is also a minimalist blogging platform for markdown and visual text editor. It also provides drag-and-drop facility, saving draft posts, sending emails, only-for-me private posts and a commenting system. Custom domain can be attached to Postagon blog. They don’t show ads and that makes your blog pretty clean. You can opt for extra features like Google Analytics integration. Earlier this service was called Freewebs.com. It is not really a conventional blog platform. They advertise themselves as a website building service. There isn’t much of difference between a website and a blog. Basically both are the different ways to organize content. Webs is a good place for those who want to have more control on how the content is organized on their blog. Like Webs.com, Weebly is also a website builder. You can make a website like a blog, a simple personal website or even an e-commerce website on this platform. A host of themes are available to choose from. By the way, do you know the difference between a blog and a website? Although many of Livejournal’s great features are paid, you still get a pretty decent blogging experiences when you sign-up for a “basic” account. Live journal is ad supported —so, it’s not as clean as Svbtle or Postagon. In the end, I would suggest that you consider Wix for making a website. Again, it is not a conventional blogging platform like WordPress.com or Blogger.com. You can make professional looking websites by simply selecting from available templates or by modifying these templates. All of the above mentioned services are good in some aspects and not-so-good in others. You need to first sit down with a cup of coffee and think what exactly you want to do on your blog. This contemplation will help you in making a better selection of blog platform. WordPress and Blogger are most popular among bloggers. They are supported by really big companies and therefore are considered to be more stable and future-proof. Great list. There are so many blogging platforms I wasn’t aware of. I like wordpress and blogger. I registered in wordpress.com for my blog but, during registration none of the steps leads to money transfer. How will I get money through blog. Just registering a blog on WordPress does not give you money, Shweta! You need to write and publish content on your blog and only then you can hope for getting some income. I know we need to write and publish the content. Then only we can make some money from blogging. Question is through which channel will they pay money (eg.they say PayPal) how does it work? I am interested in blogging. But “which platform is best for my blog?” as WordPress have some drawbacks? please tell me. Every blogging platform has pros and cons. WordPress is a time-tested software and it comes loaded with feature. That’s the reason millions of bloggers are using it! I’m a Vietnamese, my name is Nam and i living in Ho Chi Minh city. I’m very passion to make money through internet (online) since i knew this way about a month ago. I’m not a lucky man so far but i think it’s way to make me change my life forever. Everything will be begun from zero to me but i strongly believe about good result in future. The success will come sooner or later. But if i do it by myself. it’s really hard. However, i hope that you will be a good teacher (guider) who share many meaningful articles to me as well as everyone in this progress. Can u please tell me the difference? I’m B.Tech student, i want to earn some money in my free time is this possible? Very helpful sir! TechWelkin is a blog or site? Sumit, there is not much difference between a website and a blog. But to be precise, TechWelkin is a blog. which of these are more suitable for making money by advertising or any other ways ? Well, Vaibhav, your focus first should be on blogging. Making money comes later. But if you really want to plunge into professional blogging, WordPress is the best website. Yes, Anurag, most people prefer WordPress or Blogger. However, other platforms are also good enough.